You are born genius; you are born with champion stamped in your DNA. You are born "I AM ENOUGH," and then you get caught in the rip tide of life and you get sucked out into the ocean of "AM I ENOUGH?" You start drowning in doubt, fear and limiting beliefs and finally you start asking "WHATS WRONG WITH ME?" why can’t I succeed? GO FOR THE BIG is all about dragging you out of the ocean of "AM I ENOUGH?" back onto the beach of "I AM ENOUGH" and resuscitating yourself. You will finally spew out doubt, cough up fear and vomit limiting beliefs. 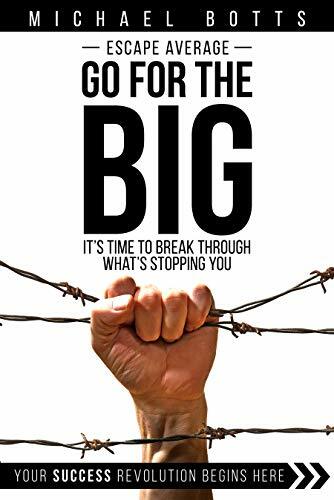 With the key success strategies in GO FOR THE BIG you will breath in confidence to "GO FOR THE BIG;" you will sprint into your destiny with outrageous courage and you will finally serve the world they way only you can serve the world.